Norwich is a picturesque city. Tombland is one of the more picturesque districts in Norwich. And Elm Hill is just about the most picturesque street in Tombland. So you get the idea - it's all cobbled streets, leaning half-timbered buildings, antique shops and lantern-styled street lights. Quaint doesn't even come close. 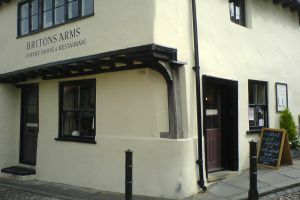 On a street corner at the city end of Elm Hill, you'll find Britons Arms coffee house and restaurant. A tea shop, to you and me. And what a tea shop. In the dim and distant past this place was, as the name suggests, a pub but now it plys a different trade, yet still serves a good brew. Indeed, at the time of writing Britons Arms serves the best tasting tea of any establishment listed here on great-tea.blogspot.com - and that's saying something! The café itself offers a choice of different teas, including fruit and decaff, but you're best off sticking with the traditional English breakfast blend in my view. It's served in a small pot, with a top-up jug of boiling water provided on the side - a nice touch, especially since the tea in question is strong and flavourful enough to bear the top-up without the second and third cups tasting like dishwater. Service is refreshingly friendly and there when you want it, without being intrusive. There's a fine lunch menu too, that seems to chage daily - there are no menus as such, it's just all on a chalkboard on the wall. Plus there are deserts that you wouldn't believe - I had a small yet rich chocolate and vanilla tart, which was a perfect counterpoint to the good strong cuppa I was washing it down with. On top of all this, it's a nice building too and, as I mentioned earlier, it's in a lovely part of the city. Add this to the fact that there are newspapers (quality ones to boot) and books (mainly food related) provided for you to read, and it's easy to see how you could lose a whole chunk of time here, with pot after pot of excellent tea. Especially when you factor in the little garden you can sit out in, when the weather's nice. Perfect! 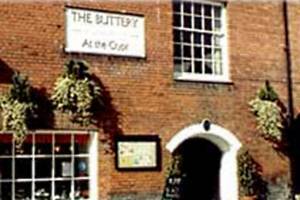 If you've ever spent any time in Chichester, chances are you've seen The Buttery already, because it's slap-bang next to the town's main tourist attraction, the cathedral. And if you didn't know that already, the café's full name, The Buttery at The Crypt, kind of gives a big clue, don't you think? You can't blame the place for making the most of its prime location and past - "come and sample a piece of history", their website says - and parts of the building date back to the 12th Century. This, together with the tea shop's vaulted ceiling (it really is a crypt! ), lend The Buttery an appropriate air of gravitas. All well and good, but what of the tea? Well, fortunately that hits the spot too. Okay, so maybe the cost is at the high end of what's acceptable - you're paying a premium, I reckon, for the surroundings in which you find yourself - but it tastes good and strong, and is served by cheerful and efficient staff. There's a pretty extensive menu served throughout the day too - sandwiches and cakes are especially good, and the cream tea on offer is, calories aside, as fine as you could wish for. So, it seats 60, is open seven days a week and sits in the shadow of a beautiful and historic landmark. Add to this the fact that they serve a range of fine teas, accompanied by a more-than-satisfactory menu of light meals and snacks, and you have all the ingredients for great tea in a great location. If you're in Chichester and looking for somewhere to have a cup of tea and a slice of cake, this is the place. And, despite the date of this review, that's no joke!